While I've always been very conscious about using a topcoat I've never really though about using a base coat. I thought it was one of those silly steps people try to sell to you. However since getting the Revlon Quick Dry Base Coat I've realised how important of a step it is within a nail care routine. I find my poslishes flake off less and don't stain my nails. Colours like blue, green and anything dark seems to stain my natural nail and then I cant for the life of me remove the colour from the nail. A huge pain when you want to swap to a lighter colour. 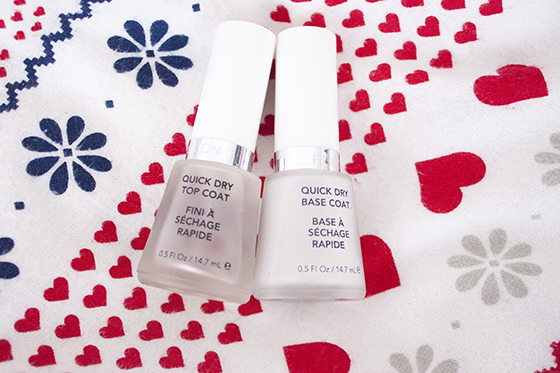 The Quick dry Top Coat is quick drying and perfect for getting that sleek glossy finish on the nails with minimal effort. It's not my favourite top coat of all time but I do really enjoy using it as it's perfect for finishing off a nail colour. While I'm not a huge fan of the brushes on either of these polishes as they are the long thing type, however the formula is excellent and really do help polish last for a while. For those conscious of DBP, Toluene and Formaldehyde polishes, these are completely free of the big three!